UC"s latest image disaster came in the form of what I dearly hope is UC's final 2010 appearance in the California press. Today's San Francisco Chronicle headline reads, "Highest-paid UC execs demand millions in benefits." 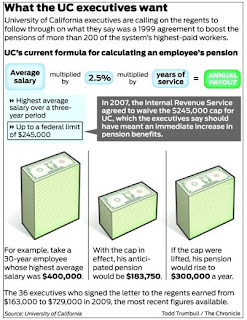 This refers to a demand by 36 senior executives that the Regents authorize UC to "calculate [their] retirement benefits as a percentage of their entire salaries, instead of the federally instituted limit of $245,000. The difference would be significant for the more than 200 UC employees who currently earn more than $245,000." The salaries and the payouts are explained in this graphic. A $400,000 salary with the cap yields a pension of about $184,000 a year, but is bumped to $300,000 a year without. I have never seen comments on any SF Chronicle story like the ones prompted here. There were 750 when I started this post. There will be over 800 before I finish. I would guess that 740 of them are negative, except that I haven't found a supportive one yet. Hundreds are furiously hostile. In the poll, only 5% think that the higher pensions should be granted if the university incurred a legal obligation to pay them. Nearly two-thirds take option 3, which is that the letter writers be fired. The symbolism of the pension spike is way beyond the actual money: UC's top officials, the ones who set the policies that affect the state, display selfish greed, total oblivion to the public mission, and a tight focus on lining their already bulging pockets. It confirms the majority suspicion that universities like UC care much more about the "bottom line" than about education (Question 6). People don't see anything in this kind of effort that universities are supposed to be about. There is in the background a sense of the university's abandonment of the state's suffering middle class, and of course nothing for the poor who still want to send their kids to college. Tuition has tripled over the decade, debt goes up incessantly, public pensions are under attack exactly because of $300,000 payouts, thousands of students show up to UC every quarter with nothing but borrowed petty cash, and yet what they see senior executives spending their time on is maximizing their personal take. As one commenter said, "oink oink oink. I know this is a dumb question but what happened to the UC system's mission of educating students?" And these aren't even the commenters who are angry that UC has good pensions to begin with. With so extensive a demand, it follows that a very large part of our social comment--and nearly all that is well regarded--is devoted at any time to articulating the conventional wisdom. To some extent, this has been professionalized. Individuals, most notably the great television and radio commentators, make a profession of knowing and saying with great elegance and unction what their audience will find most acceptable. But, in general, the articulation of the conventional wisdom is a prerogative of academic, public, or business position. Thus any individual, on being elected president of a college or university, automatically wins the right to enunciate the conventional wisdom. The Los Angeles Times responded with remarkable alacrity to the news that California legislators--concerned by the continual fee hikes and the size of executive compensation at UC and CSU--might begin to demand greater oversight over how state monies are spent in higher education. Indeed, I can't think of a more rapid response to an educational issue from the Editorial Board in recent years. One day we hear that legislators are considering certain steps, the next day we get a counter-blast from the state's leading newspaper. But is this abstract possibility really the most pressing issue for the LAT to weigh in on? What is the fuss all about? The editorial gives clues about what is really at stake--and it gives a glimpse into the conventional wisdom of California's elite opinion makers. During the current fiscal year, general fund revenues are expected to total $89.4 billion. Education spending under Proposition 98 will total $36 billion. That leaves $53.4 billion available to pay debt service on bonds — more than eight times the $6.6 billion the state will need. Thus is raised the specter, in its very denial, that the state might spend the entirety of its non Prop 98 money on servicing its own debt. Thirty years ago, general fund expenditures totaled about $7.43 for every $100 of personal income. In the 2009-10 fiscal year, that ratio was almost $2 less, at $5.52 for every $100 of personal income. In the current fiscal year, per capita general fund expenditures will total $2,246, less than the $2,289 spent 10 years ago and roughly equal to the inflation-adjusted level of 15 years ago. But then what? The obvious question is, "so what's wrong with spending less"? The next obvious question is, since we still have a deficit, why not spend still less than we do right now? These are entirely rational questions for our austerity culture, and they need direct and concrete answers. Nobody is going to care about cuts in general unless Lockyer, Jerry Brown and the new Sacramento order can rekindle belief in a causal connection in which cuts in public investment causes economic decline. But how will they, and who will help them? The Los Angeles Times reports that there is a growing sentiment among legislators in Sacramento that they should have greater oversight and influence not only in the amount of money that UC gets but in how it is spent. Strikingly, the three points that seem to have mobilized the greatest concern are the size of executive pay and perks, the continual fee increases, and the move by UCOF and UCOP to push towards more out-of-state students. As the LAT puts it, "Lawmakers say the combined actions threaten a fundamental promise of life in the Golden State: an affordable, high-quality public college education." Whatever message the Regents wanted to send by passing the Commission on the Future recommendations, the cuts message is what came through. UC officials are promising less to future students - that's what the reporters picked up. The sacrifice might go somewhere if it were done in an atmosphere of fairness, intelligence, and mutual attention and respect. The UCOF process did not increase trust or communication -- the Regents, with the exception of the student Regent, did not appear at any of UCOF's listening meetings. We'll talk about fairness in a later post on pension reforms. Then there's intelligence in planning: this would involve major educational goals for the University and a revenue plan to support it. One may not expect major educational insight from the Regents, but revenues are their central responsibility. The Recommendations I didn't get to in Part I take a shot at these. How do they do? The riots broke out after Berlusconi's government – which is, among other things, attempting to pass a massive and massively impopular overhaul of the Italian universtity system, under the name of lega Gelmini – obtained a vote of confidence (fiducia) in the Chamber, amidst much manoeuvring, with Berlusconi thus managing to remain in power. The riots went on all afternoon and were extremely violent – in fact, by far the most violent Rome has witnessed in decades. The Regents met today to discuss UCOF (which they approved) and also President Yudof's Pension proposal (modified to protect the interest of some high earners) which they also approved. The actual pension proposal is here. You can also find audio of the Regents meeting here. The short, special Regents meeting on Monday, December 13 will consider pension changes and the ratification of the recommendations of the Commission on the Future. Most commentators have found the Report uninspiring. The San Francisco Chronicle focused on elements that will reduce services to and contact with in-state students (more out-of-state students, on-line courses, and three-year degrees). There's more to the Report that this, but California is in the midst of a deep crisis in which its political and business leaders adhere to a world view that makes real solutions impossible. This bipartisan view is now taking austerity to be the way forward, although it is destroying the chance to renew public infrastructure and is starting the abandonment of a generation of young people. The UCOF Report needed to create a context that would give the public a reason to change the framework of political debate. Here are five sample steps in a purely instrumental version that could be developed much further. I deliberately omit all of the higher and deeper things universities do, like solving social and culture problems ignored by technology, or like inventing new, more humane philosophies. Economic recovery and renewal depends on high levels of educational attainment. Claudia Goldin and Lawrence Katz's remarkable economic history showed strong causal ties between U.S. early educational development and economic success: the U.S. was far ahead of European rivals in high school graduation rates by 1940 and developed a similar lead over virtually every other country in college graduation rates in the thirty years after World War II (Goldin and Katz). But we have an educational attainment emergency. The US has completely lost its educational lead. For the first time in its history, younger people are less educated than their baby-boom parents (National Center; College Board, figures 1-4). The American proportion of students starting college who actually finish is now 56%, or 29th of the 30 OCED countries (Bowen et al. 2009, p.4). California, one of the world’s wealthiest places, has seen one of the world’s most astonishing declines in college achievement. The state’s continuation rate fell from 66 percent to 44 percent in just eight years (1996–2004). California’s rank among states in investment in higher education declined during the same period from fifth to forty-seventh. The state has cut its investment in higher education by close to 50 percent since 1980, forcing tuition increases like the 60 percent rise at the University of California from 2004 to 2008, which was followed by a 32 percent rise between 2009 and 2011. The 50-60% reduction in public funding for California's universities coincided with this decline, and also caused it. Contrary to popular myth, replacing public with private money reduces educational access and the quality of the result. I will say more about this below, when I discuss Recommendation 7 in the UCOF Report. More egalitarian societies are more efficient and have higher educational attainment. This is a longer argument, but the circumstantial evidence is clear: the inequality boom has coincided with educational decline at every level. Renewed public purposes will allow a more efficient and attractive University of California. A redesigned and more effective UC, one closer to its core public and scholarly missions, is TBD at a later date. The public is ready to hear this kind of a sequence -- and to do something about it. For example, the Public Policy Institute of California recently found that three-fourths of Californians think higher education funding is inadequate. But the University of California has been having a hard time making the most of its actual popularity with Californians. It is torn between elitism and egalitarianism. The genius of the Master Plan was to have it both ways, but UC's policy frameworks and PR reflect the anti-egalitarian world view I mentioned at the start, although without actually wanting the social stratification that results. This means that UC's outreach and social missions are unconvincing to a broader public that is nonetheless waiting to be brought back in. Where does the flagship UC Future report fit into this? The Commission on the future has released its final report. You can read it here. Coverage in the LAT can be found here. The Sacramento Bee coverage is here. Check it out. The dapper Cameron has replaced the corpulent Castlereagh; England does not lead but follows the austerity bloodhounds; and the police kettle rather than kill protesters. But the English state is once more threatening to eat its common folk in the interest of the authority of capital. Despite large and growing protests including massive displays on November 10th and 24th and numerous campus occupations, the Tory-little Tory coalition plans to bring the bill to allow universities to raise student fees to a vote in Parliament on December 9th. With this vote, Cameron and Clegg accelerate their effort to end the public university in England and throw students and potential students into debt for decades. At the same time, as Iain Pears has argued, the state will game the system against the humanities and social sciences by holding the costs of certain science and priority courses unnaturally low while pushing universities to emphasize education for business instead of the business of education. This has obvious implications for the relationship among the arts, sciences, humanities, and social sciences: fund them as though they were related branches, not as though some were replacing others. Following their very successful demonstration of November 10, where somewhere around 50,000 made their way to London to protest the proposed elimination of governmental support for university teaching and the reduction of the students to debtors, UK students and faculty will take once more to the streets in London on the 24th of November. Despite the size of the protest, the Coalition government has insisted that they will not retreat in their commitment to oversee the long-term elimination of university arts and humanities while reducing higher education to an appendage of business and the immediate labor market. Strikingly, the English students, teachers, and allies are protesting against an arrangement that has long been the fundamental reality for US higher education--increasing student debt, declining government supports for higher education, the transformation of students into consumers, the redefinition of education as a commodity purchased on the market as a private good rather than a public trust promoted as a common good. Equally striking are the protesters' attempts to make common cause between the transformation of higher education financing and the larger Conservative and Liberal Democratic effort to reduce security for the poor and the elderly. As in the United States, the government seems determined to produce a general state of social insecurity. A petition in solidarity with the protesters can be found here. Closer to home, of course, the Regents last week decided once again to raise tuition on students. We will have more analysis on that in the near future. But for now I wanted to highlight two separate--although interrelated--points. The first is that the increase in fees comes right on the heels of renewed efforts by the Obama-Bowles-Simpson deficit commission to justify cuts in social security and the reduction of aid to the working and middle-classes while promoting tax breaks for corporations. As with the Regents, those in power are making "hard choices"--although for some reason they seem to be "hard" only in their effects on the less fortunate. The second point worth noting is that in the aftermath of the Regents decision and the questions raised about police conduct at the Regents meeting, campus police at both Berkeley and UCI apparently have attempted to close off free speech and protest opportunities. At Berkeley, for example, police have been reported as having torn down posters protesting police action and threatening to cite students and others for distributing the flyers. Bronwen provided links to some of these incidents in her comments on Pop The Mace. You can find additional information here and here. The latter also gives a photo of the poster in question. Please check out the links and see for yourself. Bob Samuels reports, "First of all, they voted to change fees to tuition without discussion and with a quick vote. I thought this was a historic move, but the regents did not think it was a big deal. Then they went out of their way to connect the student fee increase to the need to fund the pension for the workers and the faculty. Outside students were arrested and pepper sprayed, and one police officer pulled a gun on a student after the student took the officer’s baton. They will vote on the fee hike on thurs. People are working behind the scenes to delay the increase." Daily Cal: comes with pepper spray. Also this comment, reasonable in a normal world: ""Now (the regents) heard our concerns, maybe they'll alter some of the plans they've been making," said Ruben Santos, a custodian at UC Davis who is also an ASFSCME member, of regents meeting protests." "Provost Pitts talk to the Ed Policy Committee on the issues of nonresident enrollments. The UC Commission on the Future was suggesting that the nonresident enrollment be increased and then capped at 10%. It is currently at 6.5%. Regents had mixed reactions – a couple of the Regents remarked on the capacity issue of our campuses, and asked how nonresident enrollment increases were not going to knock out California residents. Other regents questioned why there is a specific cap of 10%, when the current enrollment percentage is not a capped percentage. Other Regents asked what are the results of these nonresident enrollments – do these nonresidents stay in the state after they leave? While data shows that 2 out of 3 nonresidents decide to stay in California for graduate school, we do not know how much of these nonresidents stay and work in California." it was embarrassing how many times Pitts had to say 'i don't know those numbers ill have to get back to you- or maybe i'll get back to you' just a friggin embarrassment- does the man not have a well paid staff?! and Eddie Island asking Taylor - why did you makes us just listen to your 20 minute presentation on UC finances. The Regents have some items on their agenda that will reshape the University of California. Wednesday the 17th at 9:30 the Committee on Educational Policy will discuss the effort now spreading throughout the system to recruit more nonresident students who can be charged more than double in-state fees. The L.A. Times report repeats without investigating claims that nonresidents will not replace resident students but will be added to them, in a zero-growth budget environment when the state has no reason to pay additional money to educate the children of Texans and Nevadans. Tune in to see if this claim is repeated and explained. At 10:15 on Wednesday the Committee on Finance will hear fairly dismal budget news. Student tuition will start going up sometime after 8:50 am on Thursday morning. And the discussion of the pension changes will begin Thursday morning at 10:15. Listen in. What comes next for universities after the Democratic "shellacking"? Michael has laid out the basic issues, and it's worth adding that the public is going to get what they didn't actually want, and then asking how to make the case for something better. First of all, the Democrats failed to make a case for a major innovation boom, one based on a serious increase in public funding. They left public spending in the twilight zone of the last-resort safety net, and now a repositioning will come too late. The Financial Times reported that the Republican victory killed flagship elements of Obama’s innovation policy for at least for the next two years. In “Corporate America welcomes power shift" (print title), the FT observes that cap-and-trade and net neutrality are gone, to be replaced by coal-and-oil and the cable cartels. The same goes for defense conversion, which would have helped research-and-development funding of the kind conducted at universities. The New York Times' Frank Rich has pointed out that neither party offered a coherent storyline in which clear solutions follow well-described problems. In spite of its favorable stance towards science, the Obama Administration does not have a serious innovation policy that aims at supporting the creation of both knowledge and middle-class jobs. And neither party has a plan for supporting and expanding public universities. Is this what people voted for? There is no popular support for the abandonment of renewable energy, or for the economic inefficiencies of the inequality boom, or for a recovery limited to the top end of the financial industry, or for a recovery based on the Fed reinflating asset bubbles, or for tuition increases at double to quadruple the consumer price index. It will take some time to grasp the meaning of Tuesday's election for higher education and the state in general. But it is possible to take some preliminary bearings. Clearly the biggest victory was the defeat of Meg Whitman. While Jerry Brown has never shown himself to be a friend to UC, he does not share Whitman's conviction that the state's problems lie in the coddled public sector. Consequently, he does not seem to share her vision that the way to economic recovery is to fire thousands of public workers, skew the tax system even more in favor of the most wealthy, or demonize poor immigrant workers (who apparently have not sacrificed enough for their betters). In addition, Brown is more likely to address pension questions through negotiations with unions than through an effort to re-write retirement through a fear-driven, personally funded, initiative. Voters also moved the budget process forward with the passage of Proposition 25 which overturns the 2/3 rule for budgets. But the question here is whether half a loaf is really better than none. While the budget no longer requires a 2/3 majority raising taxes still does--so the majority still may be unable to find the revenue to fund the programs that the state needs. Indeed, we should recognize that the election provides little comfort to those who think that the state faces a revenue problem--Proposition 24 which would have rolled back tax boondoggles granted to corporations failed, Proposition 26 which extends the 2/3 requirement from taxes to fees, passed, Proposition 22 which would limit the State's ability to draw funds from cities and county revenues passed, and Proposition 21 to aid state parks failed. The Democrats may be in control of the state government but whether they can find revenue enough to help both education, the poor, the infrastructure, etc remains doubtful. On the national level there is little reason to hope. The Republican victories in the House and in many of the Governorships bodes badly both for getting out of the Great Recession. increasing unemployment, or getting the Federal government to invest in the country. Obama is likely to seek common ground with the Republicans on Arne Duncan's plans to have markets drive public education. And whereas voters in Arizona and Florida rejected plans to cut funding to schools, voters in Washington and Oklahoma refused to raise to support schools. Indeed, it is possible to see Proposition 24 as a battle between schools and corporations where corporations won. In all, not a pretty picture. If Albany’s language departments are the canaries in the coal mine of public education, the ongoing efforts to restructure higher education funding in England are the coal mine collapsing. As James Vernon and Stefan Collini have argued, the Browne Report and the Coalition government’s Spending Priorities Review, if implemented, will mark an effective end of public higher education in England. England’s government is now proposing to shift the fiscal basis of higher education from the public to the individual student and enshrine the notion that higher education is primarily a private not a public good. Moreover, the Browne Report assumes drastic cutbacks, if not outright elimination, of public subsidies for teaching “non-priority” courses while maintaining some targeted support for STEM fields. Under the sign of fiscal necessity, Browne and the coalition government are attempting to subordinate higher education even more to the perceived short-term needs of business under the sign of appealing to the desires of students. Any notion of the centrality of the transmission of a critical tradition in higher education has been lost. We are in the midst of a class war, but only Fox News dares to use that scandalous expression. According to its pundits, it’s the “havenots” with their healthcare reforms and “entitlements,” public pensions and other soul sapping “scams” who are attacking the “haves.” At least Right-wing pundits aren’t afraid of the word “class.” Liberals, Leftists and Progressives are about as eager to talk about class as they are to undergo voluntary root canal surgery. The “haves” are much more aggressive than the “havenots” about guaranteeing that they have more and more, and the “havenots” have less and less. The “haves” continue to militate against public inefficiencies while Progressive economists and analysts have tried to show that the diminished powers of the state and the financialization of global economic activity are responsible for our slow burn crisis and the concomitant loss of consumer and political confidence. The “haves” may have lost a few skirmishes after October 2008, but you can be sure that they remain vigilant and aggressive about their long-term agenda. On a Federal level, the “haves” have targeted social and public services of every sort, from Federally funded after-school care to Social Security. At the state level, they relish the idea of privatizing public universities, whose successes have been based on decades of public investment. They have also succeeded in securing profitable arrangements between privately owned testing companies and public schools, where the demand for accountability has produced a need for ever changing instruments by which teacher and student performance are measured. They continue to argue for school vouchers and school choice and they continue to make public school teachers and unions feel the heat of their reformist ardor. Earlier this year, perusing the published list of reports regularly provided to the Regents by the University of California Office of the President (UCOP), I noticed this item, “Annual Report on Use of Outside Counsel,” and submitted a formal request for a copy of that document, under California’s Public Records Act (PRA). The annual report on the use of outside counsel legal expenses was an attorney-client privileged communication from General Counsel Robinson to the Board of Regents and is thus exempt from California Public Records Act disclosure. (Government Code section 6254(k)). I have just seen the 2008-2009 Annual Report of the Office of the General Counsel; and there one finds published data on the very topic I had inquired about: overall outside counsel expense was $100,000,000. This discovery leads me to ask that you reconsider my original request for that report, perhaps in some redacted form if there are particular details that would best (in the public interest) be kept confidential. On August 19 I received an official acknowledgment of this renewed request and was given an estimate of six weeks for the production of the documents requested. Budget shortfalls are now frequently being used to justify decisions that clearly undermine educational goals. In most cases, as in that of the SUNY-Albany suspension of five humanities departments, the few figures given do not offer specific evidence of the stated budgetary need. In the case of the Browne Report that threatens to cut Britain's public funding for university teaching by 80%, the mayhem is prompted by a polemical metaphor at the start of a section on page 47 -- public funding is a "hidden blanket subsidy to institutions" -- and anchored by one entirely unexplained number for "minimum investment" -- 700 million pounds per year. The tone of this report is one of blithe immunity from counterargument, and it is superficial in a way that is possible only for a small, appointed committee that does not feel the need to make a serious case for the millions of practitioners of the professions on which it passes judgment. In this climate, it is particularly urgent to get the numbers right, and for everyone affected to inform themselves about what the numbers actually are. America's most prominent English professor, the New York Times blogger Stanley Fish, got into the act last week by commenting that the SUNY-Albany cuts could be rejected on professional grounds but not on budgetary ones, since the humanities "do not earn their keep." Fish was roundly criticized for this, and takes up a couple of pieces of mine (the one he doesn't link is here) and by the UCLA English professor Robert N. Watson (UCLA Today version). The good news is that Fish describes the much more aggressive stance university leaders need to take in relation to political and business leaders. On the other hand, the post unhelpfully reiterates the common misconceptions about university funding that Prof. Watson, I, and others, working independently, have been trying to undo. Despite UCOP's efforts to limit the discussion of Pension reform to PEB's Options A & B they have been unable to prevent alternative approaches from emerging. The Senate Members of the task force argued forcefully in a Dissent that neither of the administration's preferred options would maintain staff and faculty quality (an argument developed further by Bob Anderson). Faculty and staff groups have moved ahead with alternative approaches. AFT, AFSCME, UPTE, and CNA in consultation with the Council of UC Faculty Associations have endorsed a set of principles to guide reform of the pension system. These principles have also been endorsed by the Executive Board of the UCLA Faculty Association. The Berkeley Faculty Association while acting in solidarity with the unions and other faculty associations has also argued for an Option D. You can see their rationale for their approach here and here. We have offered an analysis of the implications of the PEB task force recommendations as well. You can get additional information here. James Chalfant and Helen Henry have responded directly to the administration's defense of Options A &B here and pointed out that Options A& B would make UC uncompetitive for faculty and staff in an op-ed. Slide presentations from the recent UCLA Town Hall on PEB are also available. Meg Whitman raised the issue of UC pensions in her last debate with Jerry Brown arguing that the UC Pension problems were blocking access for students. Everyone should be aware that she will most likely try to move against the pension systems if she wins. You can hear the audios at the UCLA FA Blog. Thanks to Dan Mitchell for catching this point. Gov. Schwarzenegger tried and failed to covert California public pensions to 401(k)s with a special election in 2005. This year, he used the budget negotiations to force permanent reductions in the pension formula for state workers. This was a major reason for the furloughs and IOUs and uncertainty and the rest of it. According to the California Report Sunday broadcast, this was done before the future savings for the new forumulae were quantified. A cynic would say the Gov and his legislative allies held the state hostage so he could cut public pensions in the midst of the great recession. The University of California Post- Employment Benefits Task Force has also proposed significant reductions in the UC Retirement Program. Comment on their two options, Options A & B, has been quite negative, and another major faculty critique is due out this week. According to a report cited below, President Yudof now plans to end the comment period on October 14th, and that the Regents will vote on permanent changes to UCRP in a special meeting in December. I hope this is wrong: detailed analyses are just starting to come in (see below), the Academic Senate has not yet taken any position, and a rush to dilute one of the central propellants of the University of California's rise over the past forty years makes no institutional sense. We cite beneath the break an employee coalition's "Statement of Principles" and then provide additional links to presentations and commentaries for those wanting to catch up with the enormous changes being prepared over the summer. The University of California's permanent base budget share of the General Fund for 2010-11 will be about $100 million below expectations. This bring in the budget somewhat below the 2006-07 level in nominal dollars. I'll discuss the UC situation in more detail below, but will start with the overall state situation, which is even worse. Probably the worst Governor in California's history will soon be a thing of the past, only to leave the state torched, plundered and dying from his mostly inept handling of the state's affairs. A legacy of lies, treachery, deception, mistrust, favoritism and bullying litters the landscape left behind. It appears a brutish barbarian-like THUG and his closed-door cronies have all but bankrupted California to appease their baser impulses. True to the end - doesn't even get the last budget done without causing suffering and misery to tens of millions of Californians. California can flush its toilet - good riddance! California will still have great mountains, beaches, and deserts, but "baser impulses" have wrecked the only thing that ever made its society special: the use of state government for public development, sometimes at full throttle. Taxes in post-war California weren't meant only, in the low-brow contemporary way, to create a "safety net" to keep the absolute worst from happening. Taxes expected the best to happen --the country's best roads, best hospitals, best schools, best public universities. All this was for a population that had through no fault of its own suffered through the Great Depression and World War II, and was now going to collaboratively develop itself into something really special. The Berkeley Planet reports that since 2003 Gerald Parsky, Richard C. Blum, and Paul Wachter, all financiers themselves have steered UC investments and pensions towards risky private equity and real estate instruments. In order to maintain the appearance of propriety, they got UC to hire private money managers with high fees. Not only were private managers paid handsomely, their investment choices have suffered much more than blue chip stocks and bonds. $2 billion were steered toward risky financial instruments and the losses that UC suffered are negatively impacting its retirement and endowment funds. Blum, once again, reveals himself to be a beneficiary of his regental position: after being appointed to the board in 2002, $745 million of UC money was invested in seven private equity deals involving either Blum or his firm, Blum Capital Partners. People, offense is the best defense. Kudos to Berkeley Planet for excellent investigative reporting. In July, the LA Times ran Mike Hiltzik's column covering UC Regents' conflict of interest news. In the State of Washington, funding for higher education is in a free-fall. An August 29 story in the Chronicle of Higher Education reports that the State has cut the budget of the University of Washington by 33% or $134m in the past 15 months. But that’s not all, as Governor Gregoire has just signed an executive order for another round of across the board budget cuts --with an open tab—maybe 7% but could be 10%--with the prospect of another $3b state deficit in the next biennium budget (update—looks like 6%). This theme has been explored by a number of contributors to this blog over the past year. The more the university claims “success,” the worse off it gets. With the Regents set to take up the UCRP task force report -- and to consider the Senate's Dissenting Statement as well as a new UCOP Response to the Dissenting Statement --it is more important than ever that the entire university community have the information necessary to debate, and the influence to effect, the future of employee retirement. To that end, Onuttom Narayan, Professor of Physics at UCSC, has examined the logic and calculations of the different proposed solutions to the UCRP funding problems. His analysis appears below, and it concludes that neither of the options that the Task Force proposes (what they term A & B) will, in fact, solve the funding problem. Instead, they will only put off a solution for a decade. By that point, unless UC is able to make dramatically larger contributions from an as yet unknown source, either employee contributions will increase substantially or benefits will be further reduced. 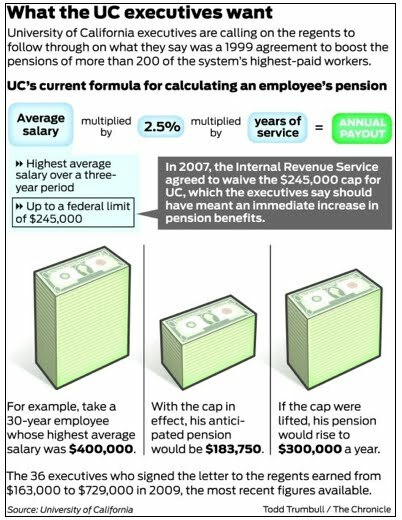 What the options will accomplish, however, is to diminish employee retirement in the meantime, and to erode the defined benefit system at the heart of the UC retirement system. Moreover, they will do so in a way that is inequitable—favoring those at the top end of the pay scale. Unfortunately, while the Senate representatives' preferred proposal (Option C) will preserve the present system with small changes, it will not solve the larger funding issues either, and will require employee contributions that are unlikely to be acceptable to all employee groups. Narayan suggests that some immediate changes may help, along with a more searching examination of the way that UCRP is managed, not to mention more equitable solutions to sharing the burdens of change. Please do read his analysis and as always comments are more than welcome. Nothing kills performance like distress. The same goes for fear, anger, powerlessness, injustice, and a sense of having been screwed over by ignoramuses. The remarkable conversation going on via the recent comments on this blog suggest that the Bain-Berkeley analysis for UCB’s Operation Excellence has dug Berkeley into a deeper operational hole than it was already in. Why is this report so disturbing? Is there anything in it that might make Berkeley administration better? The answer to the second question is yes, but the report rests on several foundational errors. These are serious enough to suggest that implementation of the report as it is will impose an outdated, centralized organizational model that will in turn undermine Berkeley’s key strengths as a university. This post describes the report’s analysis, and shows that its solutions do not fit with this analysis. I argue that the report will, if implemented, make UCB administration less efficient than it already is. I also offer one simple reason that the recommendations will also make faculty’s relations to staff worse rather than better, meaning that faculty should help staff find alternatives to the Bain-OE blueprint rather than vainly hoping that it will solve some of their local staffing issues. Bain was paid $3 million, did much no doubt unpleasant digging in financial records, and in probable conceptual deference to its a campus working group partners (8) produced 205 slides on potential savings on the Berkeley campus. The report identifies “five opportunity areas” for savings (15): Procurement, information technology (IT), energy management, student services, and a non-“area” called organizational simplification. They produced some useful data: Berkeley works with over 18,000 separate vendors, mostly lacks the equipment standards that would allow discounts via aggressive negotiations on bulk purchases, has such a diffuse IT system that server farms can be found in more than 50 different buildings, doesn’t actually meter and manage energy consumption across campus, and has spread more than 50 student services across five “control points” (slides 16-20). 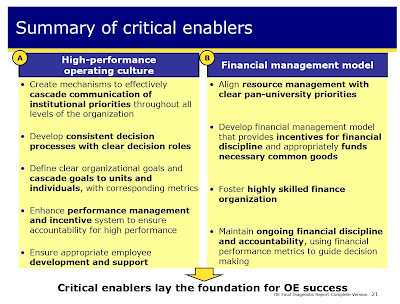 By improving these functions while also implementing organizational simplification, Bain says that the campus could cut cost in those areas by around 6-10% each (23), thus achieving annual net savings of $70 million by year four of the OE project (24). Some slides offer sensible price negotiation and consolidation strategies (e.g. 39-42). Since UCB’s annual budget is $1.65 billion (2007-08), the savings will not be transformative. But a bit more than 4% annual savings at the end of 4 years seem realistic, useful, and responsible, given UC’s ambitions and obligations as a public institution. The relatively modest cost savings are coupled with the absence of innovative thinking in this report, and the question arises about why this report had to exist at all. Weren’t these management problems obvious to Berkeley’s own administration? Didn’t anyone in the Vice Chancellor for Administration’s office count vendors and plan some remedies in 2006, when “strategic sourcing” was a management fad in UCOP, or back in 1996, when the vendor count probably hit 10,000? So one naturally wonders what is it about UCB’s administration that required it to pay Bain $3 million to tell it how to do some fairly humble portions of its job. Clues appear in two of Bain’s slides, and bring us back to the fifth opportunity area, the organization itself. First, Berkeley is not a “flat” or networked organization, but an old-school military pyramid with 11 separate layers of management (56). It is at the same time a fragmented pyramid (62) in which communication is less than ideal. The combination no doubt makes Berkeley administration at times the worst of both worlds: inefficient and yet top-down authority, which stifles creativity in the middle and lower layers without offering clear mobilization orders based on some greater vision of the whole. In addition, supervisors have fairly few direct reports, or “narrow spans” (55-57). So far, the data would suggest to most readers that Berkeley’s problem is that it is too hierarchical, has a heavy bureaucratic burden, partitions or actively hides information to the detriment of efficiency, and intimidates or inhibits lower-level staff rather than informing and empowering them. This would explain why the VC for Administration might now know just how fragmented procurement had become, and why local units would try to operate as much as possible on their own. In other words, Berkeley has too many supervisors and they do too much supervising, which makes supervising less efficient. Too much staff effort is spent negotiating authority and ensuring compliance and too little in practical problem-solving, process innovation, open communication, and direct service to faculty and student “customers.” Both efficiency and innovation depend on informal knowledge, constant information exchange, easy collaboration, and high levels of interest and trust. Berkeley’s stratification and opacity inhibits all of these. The second clue is confirmation of the effects of UCB’s elaborate hierarchy on organizational morale. Bain’s survey found that Berkeley has a very low “net promoter score” (114), meaning that a majority of employees would not recommend Berkeley as a place for a friend or relative to work. Employees also take a dim view of the organization’s mode of decision-making because it is insufficiently “participatory” (115-16). Putting these pieces together, we might assume, would mean two remedies. 1) Delayer management, specifically, the middle and upper-middle layers that supervise supervisors rather than offering direct support to teaching and research. 2) Rebuild morale by moving to greater participation by all employees in key decisions. (116). Bain and the OE working groups would then define “organizational simplification” as moving towards a relative flat organization where a smaller number of supervisors and senior executives redefine their role as coordinating participatory decision-making taking place across a decentralized “learning organization.” Efficiency would be sought through informational transparency rather than through bureaucratic authority. Knowledge and trust would increase, self-protection and suspicion would decrease, zero-sum selfishness would decline, and units would be more likely to accept and adapt to painful changes because the participatory process allowed them to understand and to influence the process, even if the outcome was not what they wanted. This interpretation would move Berkeley towards a flatter and genuinely participatory management structure. But it requires a non-corporate understanding of the university as a necessarily distributed innovation system. The university’s core missions – instruction and research – do in fact occur in frontline units rather than in central administrative offices. Its mission intelligence, in other words, is bottom-up, not top down. The university’s overall output occurs through parallel processing, in which units work on specific activities – only partially shared with others – in relative autonomy. The core activities range from computer engineering to studio art and cannot be standardized, nor can their administrative support be standardized. Efficiency is compatible with – indeed, depends on -- unit autonomy, which enables units to deliver services in the way that is most effective for their particular “customers” (first-generation students, or IT needs in physics as opposed to economics). Unit activities and “outputs” are also therefore modular. The university’s decentralization is an expression of the way its work actually gets done – and must get done. Though logistical and administrative support can certainly be improved, it cannot be improved by violating the bottom-up, semi-autonomous, modular, and decentralized architecture that has been developed over decades to support academic work as it actually takes place. A university is more like an open source software development community than it is like a production line. Unfortunately, the OE report’s solutions get this upside-down. 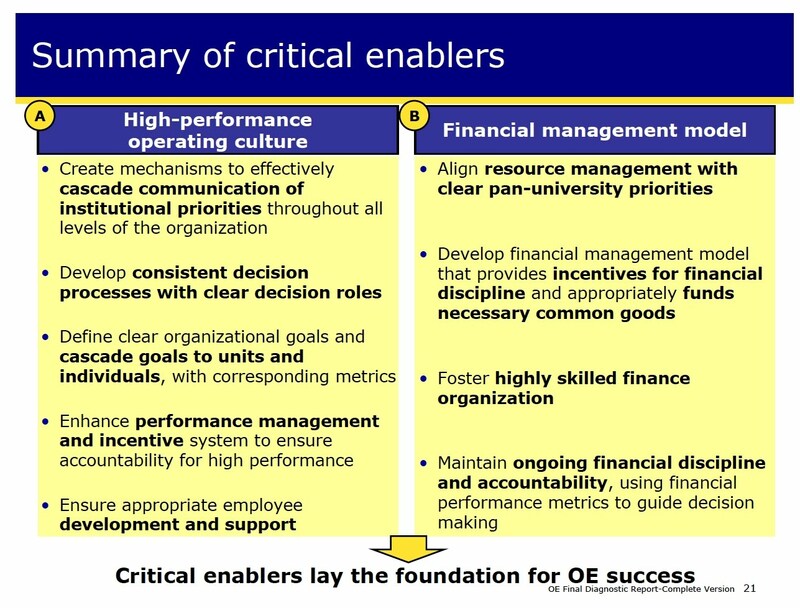 They rest on two “critical enablers” – a “higher performance operating culture” and a “financial management model” (21). At first these look like no-brainer clichés, but in fact they form a belief system that the report does not derive from its campus analysis but that it imports as pre-conceived ideas about modern organizations. 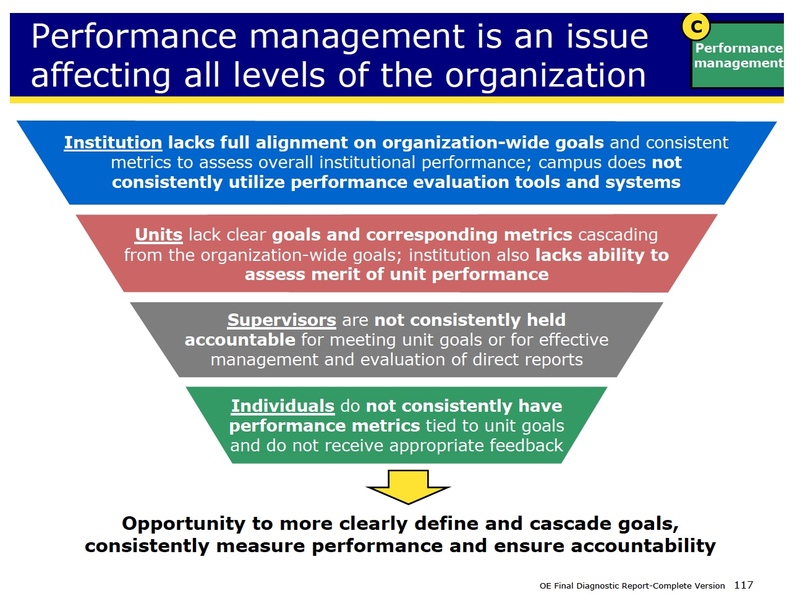 If you look at column A on slide 21, you will see that “high-performance operating culture” means linear communication and harder decision paths coupled with more measurement of employee output. Column B puts unit finances more directly in charge of those who speak for “pan-university priorities.” Both “enablers” seek increased control of units and employees. They envision the use of financial audits (and merit pay) to ensure compliance. These two empirically unsupported axioms about efficiency are what have provoked the staff concerns we’ve been seeing on this blog. They are structured to default to top-down power, and to operationalize the authority of higher-ranking units over frontliners. The report’s “enablers” convert Berkeley administration to what British scholars of higher education call “audit culture,” which predictable increases in administrative costs due to escalations in assessment and control. It follows logically that the report solves the procurement problem with centralization. The future is described in slogans like the following. “Vendor relationships: Central procurement owns all vendor relationships” (47). In this model, financial savings will come only when central procurement reduces unit autonomy and choice. One could imagine the relief of dozens of units in giving up vendor relations to a central office if and only if the units knew that the central office saw itself as a support function that would honor unit views about their own (distinct and only partially standardizable) needs. Art history may require graphics cards or processors that are not part of the standardized package. But centralized, functionally uniform service centers not only lack the kind of local knowledge that makes the unit’s activities efficient, but will define the overriding of local knowledge as part of their job. The same move toward reinforcing UC’s existing top-down, hierarchical structure appears throughout the organizational simplification section, which is worth reading carefully (52-71). The report mixes “increasing supervisory spans” with “improving front-line productivity” (54) – meaning it mingles together cutting supervisors with cutting front-line employees. The data showing that more than half of all supervisors (1000+ people) have 3 or fewer reports (58) supports the interpretation that Berkeley staff suffer from too many supervisors. The “illustrative example” shows a laborious reshuffling of units with the net result that 22 employees are reduced to 21 (68). Since OE is looking to cut Berkeley’s $700 M in staff payroll by 6-8% (23) the actual layoff rate would be double this. In addition, the report’s stress on centralization will push losses to the periphery and the bottom rather than letting them occur in the upper-middle, where the salary and efficiency savings would be greater. Faculty members should also pay close attention, because their activities will not be helped by the report’s definition of optimization as conforming local units to “pan-university” goals (6, 132). Faculty dissatisfaction with staff can be traced to the fact that staff members already do not work for faculty or for their local unit but for the pan-university. Your department’s bookkeeper may help you to squeeze the last extra value out of your limited grant money, but this is in fact not his job. His job is to provide the university’s budget office with accurate financial information, to enforce university regulations, and to protect the university from audit problems. The same is true for the IT specialist, who is already charged with minimizing costs and maximizing standardization, cross-university connectivity and interoperability. She is not charged with optimizing your office’s or your lab’s particular system. Staff are already there to fuel the university’s administrative metabolism, to the frustration of faculty and also of most staff. Bain’s plan is to make IT people report directly to central and senior IT people rather than to your department chair and/or her IT colleagues in related units. In other words, local, horizontal, cross-functional relationships will be gutted, and replaced by vertical single-function reports. Those who think this siloing and verticalization will increase efficiency are about thirty years behind in their reading of the management literature, which abounds with tales of the effectiveness of cross-functional teams and horizontal collaborations based on local needs. Similarly, Bain-OE promulgates the dumb idea that “generalist” supervisors are a problem (52, 76), although in fact they are the indispensible coordinators in any distributed, necessarily non-standardized innovation system. The first victims of this OE regression towards something that looks even more like a 1950s multidivisional corporation will be staff, and the second victims will be the faculty members who have built up local staff collaborations over time on which, in reality, their productivity depends. But the goal is not to enhance faculty productivity, but to optimize the pan-university. The big losers will be individual academic departments – their staff and faculty alike. Staff will be pulled away from frontline operational reports and into the authority field of the central office controlling their specific function. The slide that best summarizes OE’s regressive solutions is 117. The image is the bureaucratic version of the alien ship in Independence Day, a looming, inverted pyramid in which top dwarfs bottom and threatens to swallow it whole. Everything flows top-down, and the administrative content takes the form of goals-metrics-evaluation which are communicated to units (metrics –assessment of performance), on down to supervisors (accountability functions) and then finally to individuals (performance metrics tied to unit goals.) Relationships are reduced to the abstract modalities of compliance embodied in assessment procedures. Management is not support for the university’s necessarily diverse creative functions but is a state of permanent evaluation. There is no respect here for the autonomy of the units – departmental staff, student services, and technical staff for laboratories – that are close to the “customer” (cf. “autonomous culture” as a source of inefficiency in procurement, slide 35). The tone is of control through communication, through finance, through even more of the endless audit and evaluations to which UC employees are already subject. The implicit diagnosis is that Berkeley’s employees are inefficient because they are insufficiently assessed, measured, and financially incentivized. The diagnosis is anti-humanist, at odds with current literature about both human motivation (intrinsic) and effective organizational behavior (collaboratively organized). It is also ungrounded in evidence from the Berkeley campus. The predictable effect, as I noted at the start, is that the model contained in the report is already making staff efficiency worse. I don’t have first-hand knowledge of how the Berkeley campus process is unfolding this week or this month, but the public documents are not promising. There is the OE czar, central process managers, hand-picked committees making implementation decisions in smoke-free rooms, and roving HR bands hired from the outside. There is nothing there about collaborative implementation, protections for productive autonomy, bottom-up integration, non-intrusive coordination of the decentralization on which organizational creativity depends. A freeze on threats of staff layoffs tied to the OE process. Stated commitment to viewing the distributed nature of the university as a strength, and to seeing management as a coordinative support function. Full participatory involvement in implementation, starting with rank-and-file faculty and front-line staff. Only a bottom-up process will keep Bain-OE’s new centralized units and new administrators (more HR consultants, more “experienced sourcing staff” (49) from bogging Berkeley down even further. Industry also used to know this, and research managers from Kodak’s legendary Kenneth Mees in the 1920s to the “skunkworks” at Lockheed during World War II to Bell Labs in its heyday to the Internet (all top-down managed “intranets” were commercial failures) to Apache and similar open source software projects– all managed innovation through mutual respect, good communication and the participatory negotiation of policy and resources. The best way to wreck innovation in organizations is to micromanage the local units. Unless they want to spend even more time and money encouraging UC’s decline, the OE groups need to turn the OE blueprint on its head. As the many comments by staff members to the post Did I miss Something? make clear, the task force on pensions and UCOF are only one strand of the ongoing restructuring of UC. In multiple departments and offices, especially at Berkeley, staff jobs are being eliminated and downsized while faculty are away, and the attempt to cut costs on the basic organization and staffing of the campuses are taking their toll on members of staff and their ability to perform their jobs. While Bain, to take only one example, is taking home its profit for swooping in and deciding which human workers are necessary and which are disposable, the people who actually support faculty offering instruction and performing research are facing both overwork and a loss of job security. Unfortunately, this information tends to be localized. Do people have data on job losses, or information on staff restructuring and consolidation etc? The more that people know the better. With the pension report and its dissent now posted, the California Professor concludes, at the end of a helpful analysis, that "these proposals are an effort to replace the furloughs with permanent cuts in total compensation." The Daily Cal summarizes the decline narrative, and includes the kind of odd sound bites that often emerge from our UC Oakland non-campus. A Senate friend who helped draft the Dissenting Statement wrote in to explain why some of the presidential pension math I criticized is indeed correct. His comment starts below the jump. UPDATE: The Report of the Post Employment Benefits Task Force has now been posted. So has the 10-page "Dissenting Statement" (without appendicies). Mark Yudof has released a statement about the Task Force report on the UC pension system that has itself not yet been make public. The Yudof message contains perfectly OK principles regarding pension attractiveness and stability, and also some information about cost issues. I read through it wondering why President Yudof was jumping the gun. A paragraph towards the end prompted a theory. Welcome to Berkeley, probably still the best public university in the world. Meet your classmates, the best group of partners you can find anywhere. The percentages for grades on exams, papers, etc. in my courses always add up to 110% because that's what I've learned to expect from you, over twenty years in the best job in the world. That's the good news. The bad news is that you have been the victims of a terrible swindle, denied an inheritance you deserve by contract and by your merits. And you aren't the only ones; victims of this ripoff include the students who were on your left and on your right in high school but didn't get into Cal, a whole generation stiffed by mine. This letter is an apology, and more usefully, perhaps a signal to start demanding what's been taken from you so you can pass it on with interest. As some of you may have seen, the Goldwater Institute has issued a new report on administrative bloat in universities. Not surprisingly, the report points to the incredible growth of administrators (relative to faculty, students, and staff) over the last decade and a half. But there are several things that should give us pause--especially since their way of framing the subject is gaining traction in public debates. For one thing, as the chief author Jay Greene has admitted, the report has an extraordinarily elastic definition of administration--to include among other categories: librarians, student counselors, music directors, etc. More importantly, the report assumes that the reason why there has been administrative growth is because of increased public funding (or "subsidies" as they prefer to call it). No evidence is provided for such a correlation (and indeed the privates have grown administratively more quickly than the publics) and indeed it seems to have escaped the author's attention that public subsidies per student have been declining in real dollars during the last 15 years. Compared to last year, when the University was mobilized around the issues of furloughs and the President’s emergency powers, this summer has seemed quiet. But this appearance is misleading. If nothing quite as contentious as furloughs has been bandied about, the impulse that underlay the expansion of UCOP’s authority has not diminished. We would do well to focus on this impulse because it will shape the struggle over the future of the University both this year and for the long term. Two large projects have emerged this summer out of the UCOF process: first the drive towards managerial consolidation and uniformity; second the rush to approve online education. Chris has discussed the issue of consolidation, while Catherine Cole, Toby Higbie, and I have examined the details of Edley’s online initiative. But I want to focus on a separate issue here—the centralization of decision-making, the marginalization of shared governance, and the absence of transparency in the decision making of both UCOP and the Regents. Strikingly, what the Regents and UCOP made clear this summer was that their creature—UCOF—did not deliver what they wanted and therefore needed to be cast off. I've been following with interest what you're saying in the press about UC online education. I teach Statistics N21, the first online course at Berkeley to be approved by COCI. It was approved in 2007. I've been teaching it for four years, this year to 400 students. The current syllabus is here. Statistics N21 a gateway course: probably one of the first 10 you would want in your pilot. It satisfies major requirements for several departments, and is a "hurdle" course for intended Business majors. The online course comprises an interactive textbook (SticiGui) that has Java applets to illustrate key concepts, examples and exercises that change when the page is reloaded so that students can get unlimited practice with the material, machine-graded assignments scored using a mastery model, videorecorded online lectures, online and in-person office hours, a discussion board, etc. Every student gets a different version of the online assignments. The final is administered in person. Most students take the final on campus, but about 85 will take off-campus proctored finals this summer, in several countries. SticiGui has been used at other colleges and universities to teach statistics classes and to teach methodology classes in economics (at CUNY) and political science (at Bard). But it also has interactive chapters and machine-graded assignments suitable for general education classes: Reasoning and Fallacies, Categorical Logic, Propositional Logic, and Set Theory. It has been used to teach linguistics and logic classes at UCSC and SJSU. The infrastructure, applets, and so on that I have built could be adapted most easily to teach introductory courses in mathematics, economics, demography, sociology, and similar fields. But I think it would take a considerable amount of work--years of careful attention from devoted faculty--to develop pedagogically sound, interactive content worthy of UC. Even to build a more advanced statistics class using the same plumbing would take a solid year of full-time work. It has taken about 8,000 hours of my time over 13 years to develop (what I consider to be) pedagogically effective interactive content and assignments. The materials wouldn't have worked well as an online-only course for at least the first 5 years of development. I used it to teach hybrid classes while I was developing it, starting in 1997. Work continues: I'm building a searchable database of lecture "clips" on individual topics, edited from my webcast lectures. The clips will also be linked to the text where the topics are introduced, and to the glossary. I'd be happy to talk to you about what was involved in developing Statistics N21, the resources required to teach it, and what would be needed to do something similar in other disciplines. The Chronicle covers the Senate investigation into the illegal and unethical recruiting practices at for profit colleges and universities. Regulation of the industry was loosened in 2002. As reported by the Berkeley Planet and the LA Times Blum’s firm, Blum Capital Partners, has been the dominant shareholder in two of the nation’s largest for-profit universities, Career Education Corporation and ITT Educational Services, Inc. This blog has discussed the conflict question question with regard to Blum's investments and involvement in upper UC administration. The more we know about the for profit higher ed industry, the worse it looks. And yet, Blum and Edley insist that UC should adopt many of the models for education "delivery" pioneered by the for profits. Just at at time when upper administrators are trying to burnish the UC brand by hiring expensive marketing firms, they are willing to tarnish it by associating it with high level con-games pioneered during the Bush years. The unfolding summer has made it clearer than ever that the Regents have many plans but no sustainable vision for the future of UC. The plans are direct enough: administrative centralization, staff cuts, increasing tuition for students, a faith-based commitment to a second-tier of online UC education and a lowering of staff and faculty benefits. It is equally clear that those in charge at Oakland and on the Board have set themselves apart and against those who teach undergraduate and graduate students—let alone the staff who keeps the University working from day to day. Indeed, they are remarkably uninterested in the experience of faculty, staff, and students. They are happy to stay in their own echo chamber, blissfully removed from the everyday life of the University and secure in their knowledge of what the future will bring. One year ago this week, the UC Regents approved furloughs for state-supported UC employees, emergency powers for President Yudof, and looked ahead to the fee hikes that would be coming at the November meeting. The Chancellor's dramatic testimony of cuts to campus operations at the July meeting shocked the Regents and caused Regent Chair Russell Gould to form the Commission on the Future, whose working groups were just recently dissolved. In parallel with UCOF, the President's Post-Employment Benefits Task Force, formed in June 2009, has spent the past year considering major reductions in employment benefits. One year later, UC has poorer employees, poorer faculty, and poorer students. A bad year would be made bearable if we could see planning with a reasonable chance of leading to recovery. But where is this planning? The Delta Project's new report, "Trends in Higher Education Spending, 1998-2008," has data to fuel a dozen major debates about higher education policy. One finding is particularly relevant to the much-discussed proposal to get UC into the on-line education business. The interest among senior managers in on-line education was wedded in public comments to the belief that UC was weighed down by the costs of academic personnel, which was used to explain the need for pay cuts. On-line ed was thought capable of reducing these. The Delta report shows that all types of institutions already spent less on instruction in 2008 than they had 10 years before. For public research univresities, this meant a small drop from 62.8% to 61.7% of the total (Figure 9). Efficiencies are always possible, but instruction isn't the place where costs have grown. No less interesting is how overly-administrative UC is when compared to its peers. The Finance Committee of the Regents will consider an item at their July 14th meeting called "Adoption of Resolution Regarding Administrative Efficiencies" (F2). At first glance, it is guaranteed to increase the president's executive authority, but is unlikely to increase UC efficiency. It is the first item associated with the UC Commission on the Future (UCOF) to be considered by the Regents. It was not a UCOF working group recommendation, but comes from one of the Expanded Recommendations inserted by UCOP into the documents for UCOF's fifth meeting in June (page 68, Recommendation 9). It starts with harmless "whereas" clauses about the value of administrative efficiency. Then, in Whereas 5, asserts that "the Regents consider administrative commonality and consolidation a requirement for reaching the efficiency objective." At its April, 2010 meeting, the Systemwide Academic Council of the UC Faculty Senate endorsed a revised version of a pilot project on online learning that had been brought forward by the UC Office of the President and endorsed by the Faculty Senate’s University Committee on Educational Policy. In its April endorsement, the Academic Council emphasized that it would not support the use of existing university funds to develop the pilot, and that the purpose of the pilot program was to endeavor to find out how, under what circumstances, and if, quality online learning could fit the education goals and mission of the University of California. In the latest round of recommendations from the UC Commission on the Future, a set of “Expanded Recommendations,” which appears to have been written not by the working groups of the commission, but by the Office of the President itself, includes two recommendations (recommendations 6 and 7) concerning online learning. The authors of these two proposals attempt to draw legitimacy for their recommendations from the Academic Council’s April endorsement for the pilot project, but the language of these 2 recommendations betrays a set of goals that are fundamentally at odds with the spirit of the Academic Council’s endorsement and with the educational mission of the University of California. July has come again and we are without a state budget. While this fact is no great surprise, the summer of 2010 will not be simply business as usual for UC, California, or the United States. Indeed, one doesn’t have to be a Cassandra to recognize that decisions made this summer will haunt us for a long time. At the state and federal levels Democrats in disarray have demonstrated little ability to construct a political platform that could mobilize popular support while energized and organized Republicans have made it clear that they are willing to sacrifice the interests of the population in pursuit of ideology and corporate profits. On the international level mass hysteria about short-term deficits promise to drag the world economy back into another recession if not worse. And on the local level the University’s leadership (both in Oakland and on the Board of Regents) is primed to accelerate UC’s transformation into an increasingly feeble copy of an already crisis-ridden economic order of increased hierarchy, indebtedness, labor intensification, and the destruction of any sense of common purposes or commitments. I love steadily declining educational resources as much as the next person, and very much enjoyed this report just out today, which shows that California after years of striving now has successfully achieved the worst schools in the nation, 44th in this, 46, in that, 50 in librarians pet student - all numbers that make us special. We are also 50th in class size, having the most students per teacher in the United States. In 2009-10, California classes were 50% larger than the national average. 10 used to be small groups for 1st year students, to give them the kind of detailed feedback that would set them up well as college writers. 15 used to have sections and now it doesn't. Other courses have half the sections while still others double or triple in size. Let CA high schools be our destiny. When I was a graduate instructor at Cornell University, I had one section of 17 engineering students each semester. The semester writing requirement was 30 pages over about 12 weeks. Each student wrote an essay each week, and the total number of pages was for most students closer to 60 by the time the term was done. Each student received a marked-up essay back from me after the weekend, getting 200-300 comments over the course of the term. I still get email from Cornell engineers from that period thanking me because they have remained among the best writers and communicators in any workplace they've been in since. This was not because I was such a brilliant writing teacher -- I was learning on the job -- but because elite schools provide the conditions to instill elite-level skills. The UC Idea was mass access to this elite quality. That is what is being taken away. A typical UC teaching assistant already has 50 students a quarter in the humanities, and 75 in the social sciences. If a lecture is taught with half its TA load, each TA will have 100 students. A reader is not paid even to show up to lectures, and will have in the above case 50-70 papers to grade. The loss for educational attainment should be obvious to all. Though everyone is trying to mitigate such loss, the decline in outcomes are not being estimated with any precision. In keeping with reductions in instructional services, departmental offices have got to go - at least for the humanities. Why should individual departments have offices for staff working for that department, its faculty and its students? Why not create large staff pools organized by building and given names like "Humanities South Administrative Support Center"? Faculty will grumble for a while, and write emails about why the printer has be one floor below in the Phelps Humanities Administrative Support Center. But they will get used to it and go back to their work. There was a temporarily outbreak of email around the question of whether faculty should post on their office doors a sign that said something like "private office" in order to ward off the large numbers of wandering undergraduates who, unable to get into classes, may stalk the halls trying to find a professor to talk to, or, failing that, rest in an Administrative Support Center. "Private" signs were finally discouraged. Wow, this reminds me of the good old days of the Dwinelle cluster. The Dean's office waited until a manager said that she was going to be moving away, then, knowing there would be a vacancy, sprung it on us. It was also very top down. They talked it up and implied that as we staff would be taking on more duties our pay would be adjusted accordingly. Then they left us to do the very difficult work of creating systems that worked for multiple departments without destroying departmental traditions, physically moving our offices (twice) and establishing relationships with a new set of faculty who had no input into our hiring. All that for not a penny more and they resisted reclassifying us for an additional 6 months. They put a vastly unqualified personal favorite of the dean in charge of our clustered unit. The faculty and staff fought this tooth and nail, except for those who became convinced that their personal star was hitched to this clustering. It made for an ugly, stressful scene for several years. Here is something people should watch for: people who analyze staff positions from up on high tend to want to simplify what staff actually do in order to make the reorganization easier to theorize about. So, while in my old job I had been 75% Student Affairs, 25% department library supervisor, in the new regime I was "only" 100% Student Affairs for 3 departments. Ultimately I became library supervisor for the 3 small department libraries. I did web design for all departments, set up database tracking systems for all departments. All things requiring knowledge and effort and all things that didn't fit into their calculations. The Dwinelle clustering was built on the theory that fewer people could accomplish more if they spent more time on similar processes. I have asked people in the Dean's office how that eventually turned out and they said, as each department came to them and told them that it was impossible to accomplish what was required of them without more staff, that the staffing of all the clustered departments eventually came back up to the original levels. You can't make work disappear to any significant amount just by shifting around people. Plus there is a steady stream of new work being handed down to the academic departments by the central departments. Once you get done paring staff down the the bare minimum, there is nobody left with any time for the new work. Staff have been outraged by the recent Bain report because it looked only at payroll titles and declared that there were a bunch of "supervisors" on campus who were only supervising 2 or 3 people. The report made it look like these people did nothing else but sit in their offices and make daily rounds to make sure their 3 employees were doing all the work. Again they have simplified what people do and left out the complexities of each job and the fact that "supervisors" spend the vast majority of their time processing things alongside their fellow staff. I've been concerned that Berkeley faculty have not spoken out publicly about this misconception. I'm concerned on the Berkeley front that faculty will be effectively separated from staff by being told that their future salaries will suffer if they keep their staff. I guess, at this point, if I were asked to accept a future cluster rather than be laid off in these miserable times, I would say "bring on the clustering and I'll do my best to make it work." But it's guaranteed to cause a huge amount of disruption in the near future and may not achieve any where near the savings that the higher ups expect. Just a few more years and I can retire to write another "Moo", western version and maybe get rich. Meanwhile, good luck with your clustering. If anyone wants advice on how to cope, there are people at Berkeley who could offer some. UC Autonomy: Is that Campus Closing? Is California K-12 Our UC Destiny?